2nd generation legendary Fire/Flying type Pokemon. Pokedex Entry: A legend says that its body glows in seven colors. A rainbow is said to form behind it when it flies. The perspective and the background reminds me of Shadow of the Colossus. Is this intended? The composition and perspective inspire me. It's second generation since it's in the second generation Pokedex, and wasn't even seen in the first generation games. Why can't I find one of these? Wow, awesome. The pose is just perfect! Dude, you are really good at doing things with dynamic perspective. Most of all though, you excel in portraying movement. Not to much boring stuff in here dude. Wow.This is a really cool Ho-Oh. one you can paint well. Fantastic! Yes! finally an awesome ho-oh picture without his head pointed sideways into the air!! You all know the pose I'm talking about. This is awesome, I love your style. Is he in an actual location of just a spontaneous background? Great job. 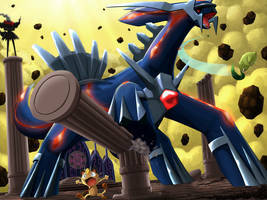 Did you have an actual Pokemon world location in mind as to where this takes place? WOW..!! Awesome I love it hehe n_n..!! That pose and angle look incredible. Oh wauw, awesome job. I love the perspective in this one. are you familiar with animorphic flare lens?